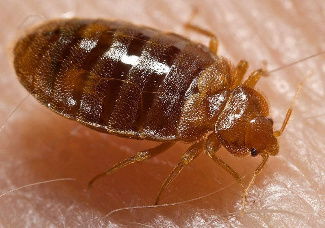 Bed bugs are small, flat wingless insects that are reddish-brown in color and approximately one-quarter inch long, before feeding (about the size and shape of a small apple seed). They hide during the day on beds (mattress seams, box springs, bed frames, headboards) and in cracks and crevices of walls, floors and furniture. They come out at night. They do not fly or jump, but they can crawl rapidly. How can bed bugs get into my home? They can come from other infested areas or from used furniture. They can hitch a ride in luggage, purses, backpacks, or other items placed on soft or upholstered surfaces. They can travel between rooms in multi-unit buildings, such as apartment complexes and hotels. Bedbugs should not be equated with filth or sanitation problems — in hotels or in homes, for that matter. Bedbugs are very elusive, transient pests. They are often found in other areas besides the bed. And they are hardy. They can live for several months without eating and can withstand a wide range of temperatures from nearly freezing to 122 degrees Fahrenheit. Bedbugs can be controlled with vigilance, constant inspection and treatment by professional pest control companies. Bed bugs have become a major pest control concern as their populations have continued to rise over the last decade. If you’re looking for expert advice on how to get rid of bed bugs, you’ve come to the right place. Here at Big Apple Pest Control we know how to determine if bed bugs are in your home. If you think you might have bed bugs or just want to prevent these multiplying guests from entering your home, call Big Apple Pest Control today!